Used naphtha to prep and do limited cleanup. Work quick. Tried the ice cube to smooth bead but I am a clutz.. Used a rubber edged tool with well defined sharp edges to tool the bead and clean off excess plus fingertip when needed. Excellent adhesive sealant and much better than silicone based products. My local RV center was going to charge over $600 to scrape & re-caulk the corner and window seams. On a 2 yr. old class C, they told me that this will have to be maintained on a 6 month basis. They also told me not to use cheap $5.00 silicone from a home center to do this. After some web research, this product looked to be the best to me. After scraping off the mastic which was pushing out from under the seams, and cleaning off the residue with some MEK, I appplied the Proflex. It applied very smoothly for such a sticky sealant. You will get one chance to smooth the bead with your finger, so make it count. After that, it immediately gets tacky and you will drag the bead instead of smooth it. In 24 hours, it set up; not too hard, or too soft. This product looks to have superior adhesion and be tough as nails...only time will tell. This is the best product for this application, and I would highly recommend it. 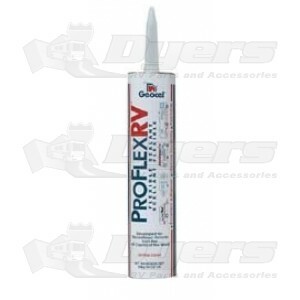 This sealant is a superior product . Make sure you finish the application , it will set up quick. Also before you purchase make sure you know EXP Date on end of tube. ( Shelf life only good for 1 year) Once used has a 20 year cap..The last two digits is the year and the other digits : the weeks in that year.. If you let this be known to Dyers when purchasing they will take care of you..